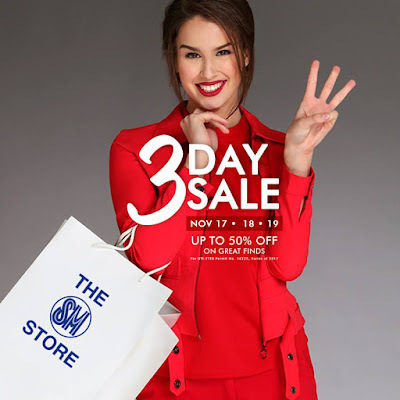 Don't miss The SM Stores' 3-DAY SALE on November 17-19, 2017 at The SM Store Makati, Cubao, Harrison, Quiapo, and Delgado*. SM Prestige and BDO Rewards Diamond members get an extra 10% OFF on all items on Friday, whole day, November 17, 2017. SM Advantage members get an extra 10% OFF on all items up to 12 noon on Saturday, November 18, 2017. SM Prestige, SMAC, BDO Rewards, MOM, Primo, SSI, and Love Your Body members get an extra 10% OFF from 5 to 7pm on Sunday, November 19, 2017. *The SM Store Delgado's 3-DAY SALE is from November 16-18, 2017.